When it comes to windows and doors for a new construction project, Sprouse windows and doors perform like no other. Each and every one built to exact specifications and feature warm-edge technology to maximize efficiency. Many styles even feature our exclusive ProChannel® frame design to help make installation fast and efficient. 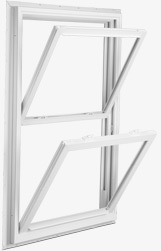 Windows feature fusion-welded frame and sash with integral nailing fin and ProChannel® design. Critical door panel profiles are reinforced with steel for stability. On window units, 3/4" Maximum Performance Glass™ package is standard, but may be upgraded to MPG Plus™™ or MPG Extreme™™ packages. On sliding doors, 3/4” double-strength, tempered glass is standard.